As organizations increasingly adopt polyglot database architectures with data across multiple disparate data sources, deriving a unified view into that data becomes a difficult proposition where significant engineering efforts must be spent to cleanse, join prior to defining and loading into a traditional data warehouse for reporting purposes. Cloud9 Charts is excited to announce our Multi Datasource Joins feature. This allows users to query data from one data source, perform look-ups and joins against other sources, and seamlessly store the merged result into a schema-less warehouse, along with visualization and analysis capabilities on it. 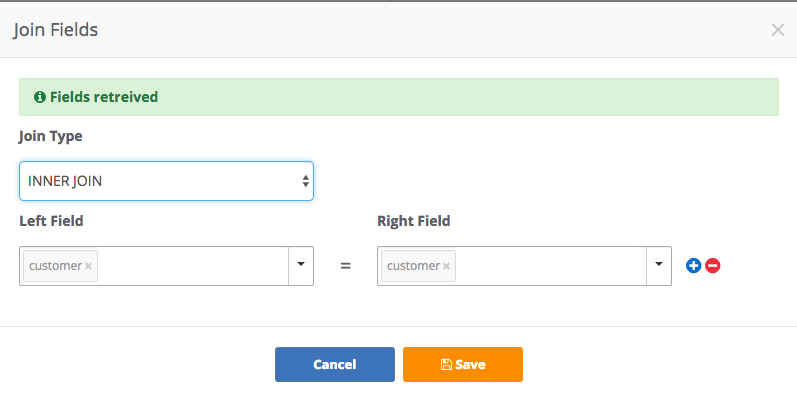 In the following example, we’ll connect and query a MongoDB database, then perform an inner join against a customer table in MySQL to retrieve the customer details for each result. Click on the Datasource icon on the left menu --> select MongoDB --> accept the default settings (points to a MongoDB instance that we run on the cloud). Similarly, set up a MySQL Datasource to point to the default settings (see GIF below). Use data the Query Generator to dynamically generate the queries. Select "sendingActivity" from the collections drop-down menu. Select "sent" from the metrics drop-down menu. Click on the selected item to perform a Sum aggregation it. Select "customer" from the dimensions drop-down menu. Now, for the returned results from MongoDB, let’s look up the customer details, which is stored in a MySQL table called customer. Map fields from previous queries to the current one using "join fields"
The preview should now contain data from both MongoDB and MySQL that includes address and currency fields added to the MongoDB query for those customers. Click on Save. This dataset can now be added to a dashboard and shared/embedded easily. In a few simple steps, we’ve gone from raw data to insights from multiple datasources.